Syndesis uses Maven as build tool. Maven groups are used to separate the various Syndesis parts. rest io.syndesis.rest syndesis/syndesis-server REST backend for managing integrations. This is the main sever. The following conventions are used for naming directories, modules and Java packages. These conventions are mandatory and should be also checked for when doing pull request reviews. Each directory directly below app/ is specific for a certain Maven group. E.g. the directory app/extension is reserved for all Maven modules belonging to the Maven group io.syndesis.extension. The directory name is reflected as the last name part. All names (groups, modules, package) are using the singular form. E.g. its a io.syndesis.connector, not io.syndesis.connectors. Each Maven module is prefixed with the last part of the group name. E.g. the directory app/integration/api holds a Maven module for the the Maven group io.syndesis.integration, and the module’s artefactId is integration-api. A module’s directory name is directly reflected as the last part of the Maven module name. If the Maven module name consists of multiple parts (e.g. artifact integration-project-generator), then the corresponding directory is also a concatenated word (like in integration/project-generator). Multipart names should be the exception, though. There should be only one level deep modules, so each Maven group directory holds all Maven modules flat. Each module has a single top-level package, reflecting the Maven module name. E.g. for the Maven module common-util in group io.syndesis.common has a single top-level package io.syndesis.common.util This top-level package should reflect the artefact name, with dashes replaced by dots. Not every module has been already transformed to this scheme. This will happen step-by-step. But for new groups and modules this scheme has to be followed. We use GitHub labels to categorize epics, issues and tasks. They are the foundation of our process, so please use labels for issues. Labels are living entities. This document describes the current status and might be slightly outdated. Please send a PR to adopt this section if the label structure changes. Also feel free to discuss the label structure anytime. It’s essential that labels describe our process, not that we have to adapt our process for these labels. Labels are grouped. Each label consists of two parts: A Group and a Name which are separated by a slash (/). For example, the label module/ui is used to mark issue which is relevant to the Syndesis UI module. The following label groups are available. There must be only at most one label from the “Exclusive” groups. source/ Where did the issue originate from (stakeholders)? i.e. source/qe indicates that QE raised this issue. status/ Status of an issue or PR. Each label group serves a particular purpose, and for each issue and PR, it should be considered whether a label from a group applies. 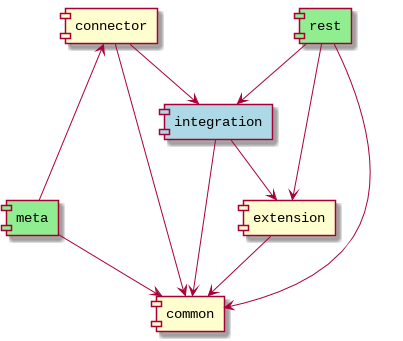 Labels from this group reference our application groups like “rest”, “ui” or “connector”. Each sub-team is responsible for one or more group, and every group has an ‘owning’ team. That does not mean that members of other teams are not allowed to work on such groups. Contrary, this is even encouraged. But its just there so that teams can filter on issues and PRs which are relevant to them. An issue can carry many group labels. Especially Epics will carry more than such label as they touch more than one group (otherwise it wouldn’t be an epic). cat/bug A bug which needs fixing. cat/build For issues which have relevance for the build system. cat/design A concrete UX design. Use this for PRs containing UX designs. cat/discussion This issues requires a discussion. cat/process Development process related issues carry this label. cat/question For issues holding a question. cat/starter An issue which is easy to solve and can be used for ramping up new developers. cat/techdebt Label for issues identifying technical debt. cat/techdoc Technical developer information (likes this handbook ;-) related issues. This category of labels is all about pull requests. All of them have a meaning for the pure-bot bot which watches a pull request and performs certain action. These actions also involve monitoring and creating labels. pr/approved This label will be automatically applied to a PR as soon as the PR has been approved at the end of a review. It is an indicator for pure-bot to automatically merge the pull request if it passes all required tests. You should not set this label manually for approving a PR but using the GitHub button to do so. pr/needs-backport This pull request needs a corresponding backport to the latest patch branch. pr/review-requested In our process it is not mandatory to have a PR review. However, if the author requests a review via the normal GitHub functionality, this label gets applied automatically. When this label is set on a pull-request, then the mandatory status check pure-bot/review-requested will only pass if at least a single pull request has been given, so prevents manual merging (without forcing). status/wip This is a PR request label which should be used for “Work-in-Progress” kind of PRs which has been submitted for early review. If this label is present on a PR, the PR is not merged, even when it is approved. A dedicated mandatory status check pure-bot/wip monitors this labels and prevents merging if this label is present. Notification labels from the notif/ group serve a particular purpose. They are used when one team wants to notify another group that a specific issue might have them relevance to them. notif/doc The issue needs some attention from the docs team. This might because a new feature has been introduced or, more important, an existing feature has changed for which a documentation already exists. notif/pm The issue needs input from product management. notif/triage Every new issue gets this label and is considered during a triage session for properly priorisation and categorisation. Remove this label after the triage has happened. notif/uxd This label should be used for issues which needs some attention from the UX team. This might because a new feature has been introduced or, more important, an existing feature has changed for which a UX design already exists. It is important to note that these labels also be removed when the notification has been received. For example, when a UI feature like an input form changes. Then the UI team attaches a notif/uxd label to the PR which introduces this change. The UX team, detects with a filter search on this label, that there is a new notification. It then decides, whether UX design needs to be updated or not. In any case, they are removing the notif/uxd label and add a module/uxd label if this PR indeed requires a UX design update. If no update is required, then the label is removed without replacement. Labels starting with source/ indicate the origin of an issue. It should be applied to help in triaging and prioritizing. This label group should be used if an external system is referenced, which is not part of the Syndesis mono repo. For the future, we plan to add more of these external repos into the Syndesis mono repo (like documentation or QE). If this happens, then labels should be converted to module/ kind of labels. Status labels are unique since they may trigger some automatic actions. status/blocked The current issue is blocked by another issue. Refer to the issue itself to see what is blocking this issued. This label is purely informal. If you’d like to get a local development environment up and running, for both the UI and REST API, this is how you’d do it. Build on branch, not master. You can follow these steps if it’s your first time setting up Syndesis, or if you want a fresh local installation to replace an existing one. Some environment-specific instructions may be available below as well. Make sure you have installed node version >= 6.x.x and Yarn version >= 0.18.1. Install a hypervisor for Minishift. Install a hypervisor for Minishift. For macOS, we recommend using the Docker xhyve plugin here, which can be installed using Homebrew. Install Minishift. For macOS, we recommend you use the Homebrew method. The goal here is to download the project to your laptop/PC, and to install Minishift, the VM that contains OpenShift. This uses an existing Minishift instance. Start of the Day Make sure Minishift is running. This step is required regardless of whether it’s a first-time install or not. It logs you in and points OpenShift to use Minishift resources. The eval’s set a number of environment variables, like change the $PATH and $DOCKER_HOST, so each time you do a Syndesis build it’s good to make sure those are invoked. This step is optional. This command expects Minishift to be running already. It’s the -i docker that determines the workflow, for Roland it seems to work without that though. It would clean the database if we increase the schema version, if we don’t it remains the same. Now start pgadmin and add a new DB server, use localhost for the host setting. For the username and password look on the DB pod’s Environment page in the OpenShift console. In pgadmin you can see the table by navigating into the tree under Server Groups > Servers > syndesis > Databases > syndesis > Schemas > public > Tables > jsondb. Right click, and then go to View Data > View All Rows. After you’ve set up your initial Local Development environment, you’re ready to contribute to the UI. The yarn start:minishift command works when it can properly detect your local development machine’s IP address. A proxy server inside the minishift deployment will use that IP address to connect back to the development server being run by the yarn command. If detection of the IP is failing for you, then set the SYNDESIS_DEV_LOCAL_IP env variable to your local machine’s IP address before running the yarn yarn start:minishift command. Another option is to run minishift console, go into My Project and click on the URL for the Syndesis app. To verify that you’re running against the development instance of the UI check the title of the browser tab you’ve opened and ensure it says DEVELOPMENT in in somewhere. Not using Minishift resources In the event that you have issues with Minishift. Don’t be surprised if most things don’t load and there isn’t any data in the UI. Only use this if you’re totally blocked and need to work on something minor/aesthetic in the UI. To run tests or lint there are two more commands you can run in separate terminals. If you don’t, the CI will, and your PR build will likely fail. Or manually with compodoc -s, or compodoc if you want it to simply generate the files in the default /documentation directory and run it with an HTTP server. After you’ve set up your initial Local Development environment, you’re ready to contribute to the REST API. When things go wrong, you want to try to identify the area that is causing problems (UI, REST API, etc). If it’s the UI, look for errors in the browser console or the terminal to see if it’s a dependency issue. This is a known issue. This is the workaround for using the latest REST image from the Docker stream. NOTE: This deletes your Minishift instance, installs OpenShift templates for the pods, and restarts Minishift. Disclaimer: It’s not 100% clear what -i docker for Syndesis Minishift --install does exactly, but there is no way to invoke those evals before you get a running VM, which is what --full-reset does. So as a rule of thumb, you can have a terminal with those evals and keep it open and do all of the Syndesis building from there. syndesis command not found If you get 'syndesis' command not found then use the full path to the syndesis binary instead. This assumes you are in the root of the project directory. If OpenShift templates have been updated This should not be the first choice, since it changes the IP of the VM, and in general should not be necessary for just building and updating the version.